It’s A Charlie Brown Christmas! Spread Christmas cheer with the Peanuts Gang. A staple of Christmas celebrations for decades, these treasured and timeless characters are perfect keepsakes to spread glad tidings to your loved ones throughout the holiday season. At The Ornament Factory, we have something for every Peanuts fan with every type of tree. From vintage Peanuts keepsakes to 2014 keepsakes, let the charm and optimism of these Hallmark keepsake ornaments add a touch of delight to your holiday décor. Sure to be enjoyed for generations to come by old and new fans alike, the Peanuts gang will shine brightly on any Christmas tree. 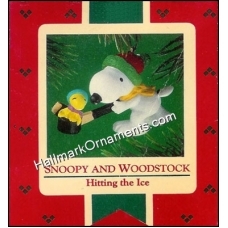 Browse our selection at https://www.hallmarkornaments.com/Peanuts_c_217.html to find collectible keepsake ornaments featuring Snoopy, Charlie, Linus and the Peanuts gang. For a festive touch that will delight children and adults alike, celebrate the season with this cherished group of friends available in keepsake ornaments. Shop at The Ornament Factory today for the best selection at great prices! Eagerly waiting for Christmas morning? So is Ralphie, one of the lead characters from the beloved holiday movie, A Christmas Story. A family tradition since 1983, unofficial Hallmark keepsake ornaments to accompany the movie, A Christmas Story were first released in 2006, and remain very popular to this day among collectors and movie fans alike. Perhaps best known for the tagline, “You’ll shoot yer eye out”, our collection of A Christmas Story ornaments include a number of Leg Lamp ornaments, as well as ornaments that highlight classic moments from the film. These ornaments, like the movie, are sure to be memorable additions to your holiday celebrations and prominent ornaments on your tree. Can’t decide which one? Oh…fudge! With our great prices and fast delivery, who says you can’t have them all? Shop online with The Ornament Factory at https://www.hallmarkornaments.com/A-Christmas-Story_c_234.html and add these timeless ornaments to your Christmas story, today! Did someone say it’s getting cold outside? We think it’s getting frozen! At The Ornament Factory, we have Elsa and Olaf ornaments from the movie that warmed the hearts of all, Disney’s animated classic, Frozen. A Hallmark Gold Crown Exclusive, the Elsa and Olaf ornaments are available in limited quantities from The Ornament Factory. Also available as a keepsake ornament, Olaf the Snowman (https://www.hallmarkornaments.com/2014-Olaf-Disneys-Frozen_p_22802.html), who was created by Elsa’s magical powers and is sure to delight each onlooker as he gleefully hangs on your tree this Holiday season. Make your tree a magical place to be with keepsake ornaments from The Ornament Factory. For extra magic and cheer to last year after year, shop online with us!